Aculon Inc. were granted a patent on 15 October for “Electroconductive Inks made with Metallic Nanoparticles”. Aculon are well known for their surface coatings using nanoparticle technology, featuring improved adhesion to a wide range of surfaces and adding functionality for numerous applications including printed electronics. It is therefore no surprise that conductive inks are described with advantageous adhesion to a variety of substrates including silicon, glass and plastic. The granted patent is US8558117 and the claims are quite broad but require the inks to have an omega substituted organophosphoric acid, this is the added ingredient which helps to improve the adhesion. What is claimed is: 1. 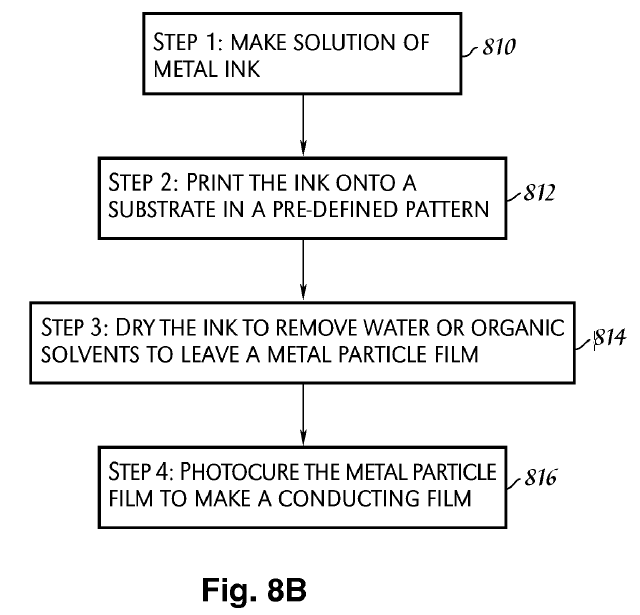 An electroconductive ink comprising: (a) a dispersion of metal nanoparticles with a dispersant on the surface of the metal nanoparticles and as a separate component, (b) an omega substituted organophosphorus acid; the metal nanoparticles being present in amounts of 5 to 80 percent by weight and the omega substituted organophosphorus acid being present in amounts of 0.0005 to 5 percent by weight; the percentages by weight being based on total weight of the electroconductive ink. 2. The composition of claim 1 in which the metal is selected from copper, silver, palladium, gold or any combination thereof. 3. The composition of claim 2 in which the metal is silver. 4. The composition of claim 3 in which the dispersant is an organic carboxylic acid. 5. The composition of claim 4 in which the organocarboxylic acid contains from 4 to 36 carbon atoms. 6. The composition of claim 1 in which the metal nanoparticles have a particle size of 1 to 500 nanometers. 7. The composition of claim 1 in which the dispersion contains an organic diluent. 8. The composition of claim 7 in which the organic diluent is selected from hydrocarbons, alcohols, esters and ketones. 9. The composition of claim 1 in which the organo groups of the organophosphorus acid have omega substituted functional groups. 10. The composition of claim 1 in which the omega substituted functional groups are selected from phosphonic acid, carboxylic acid, hydroxyl, thiol and amine including various combinations thereof. I have reported on a number of conductive ink patents over the past year or two and a common theme running through them is the need for good adhesion along with their conductivity. The patents generally differ in the description of the adhesion promoting substances used in the nanoparticle inks and on other improved properties that enhance their application for printed electronics. Successful conductive ink formulations are essential for printed electronics to become a mainstream technology for building new devices and specialist inks with patented formulations will continue to dominate the scene for a number of years before generic formulations will be cheaply available as we see for conventional inkjet printing. 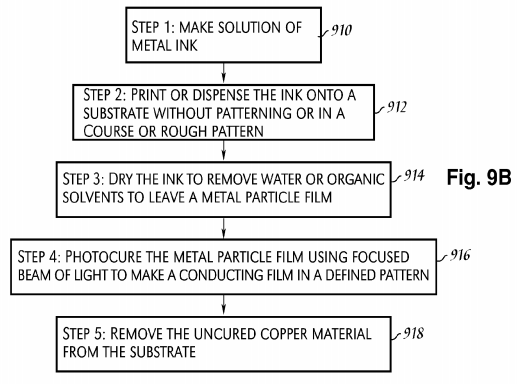 I recently spotted a patent for copper based metallic inks jointly granted to Applied Nanotech Holdings, Inc. and Ishihara Chemical Co., Ltd. The conductive inks I have previously reported on have been silver or graphene based, these can be very expensive and so there is always interest in a lower cost alternative. Copper metal is a standard in the electronics industry and is about one tenth the cost of silver. A metallic ink including a vehicle, a multiplicity of copper nanoparticles, and an alcohol. The conductive metallic ink may be deposited on a substrate by methods including inkjet printing and draw-down printing. The ink may be pre-cured and cured to form a conductor on the substrate. 1. A conductive metal ink comprising: a vehicle comprising two or more oxygenated organic compounds; copper nanoparticles; and a medium length chain aliphatic alcohol, wherein the ink does not comprise a binder. There are a further 23 claims giving more details of the components mentioned in claim 1. This is a key patent for copper inks and has a broad first claim which had to be modified from the original application by the addition of the restriction that the ink does not contain a binder and I suspect this was to get around some of the prior art identified by the patent examiner. Six very detailed examples are given which illustrate the invention and provide further details of the printing process, the curing or sintering that is applied to produce the conductive tracks on a range of materials including flexible substrates. Abstract: A conductive ink composition comprising organic-stabilized silver nanoparticles and a solvent, and a polyvinyl alcohol derivative resin of Formula (1) wherein R1 is a chemical bond or a divalent hydrocarbon linkage having from about 1 to about 20 carbons; R2 and R3 are independently an alkyl, an aromatic or substituted aromatic group having from about 1 to about 20 carbon atoms; x, y and z represent the proportion of the corresponding repeat units respectively expressed as a weight percent, wherein each repeat unit is randomly distributed along polymer chain, and the sum of x, y and z is about 100 weight percent, and wherein the polyvinyl alcohol derivative resin is present in an amount of from 0.1 to about 5 weight percent of the ink composition. Abstract: High performing nanoparticle compositions suitable for printing, such as by inkjet printing, are provided herein. In particular, there is provided a conductive ink formulation comprising silver nanoparticles which has optimal performance, such as, reduced coffee ring effect, improved adhesion to substrates, and extended printhead de-cap time or latency time. The ink formulation comprises two or more solvents and a resin. The key technology improvements over the general prior art are for the development of inks which do not dry out and clog the printhead along with improvements in the adhesion of the ink to the substrate, reduction of the coffee ring effect and reduction of particle aggregation which leads to black dots in the printed lines. The improved adhesion is as a result of the incorporation of a resin in the ink based on a polyvinyl alcohol derivative. The earlier patent goes into some detail over the formulae for these resins. The extended drying times to prevent printhead clogging are the result of incorporation of two or more ink vehicles (solvents) with vapour pressure properties as described in the second patent. Typical compositions are based on aliphatic hydrocarbons comprising at least one cyclohexane ring, cyclic terpene, cyclic terpinene, terpineol, methyl naphthalene, and mixtures thereof. Typical drying times are in excess of 5 hours and one claim states up to about 1 week. The nanoparticles are stabilised with organo-amines, the first patent gives more detail on these structures, a preferred compound is dodecylamine. As always please leave a comment if you require further details or are interested in patent landscapes related to these conductive inks.